Have you ever wanted to know how to make tamales? It's easier than you might think, especially when you use quality ingredients like HERDEZ® sauces and chiles. Today I am sharing TWO tamale recipes: Green Chile Easy Chicken Tamales and Red Pork Tamales. We celebrate Las Posadas loosely in my family. We make food and visit and share stories but there is no formal pattern that we follow. There's a nativity scene, tamales, and capirotada but I think it is the distance that has made the celebration more of something that we do as we can get together, not according to a strict schedule. This is why tamales are such a common dish for us at this time of year. They're easy to heat and serve no matter what time of day family comes over. And who doesn't like to go home with a bag of fresh tamales after visiting grandma? The first part of our tradition centers around making the tamales together. The family comes together, usually at my mom's house, and we make tamales, talk, share stories, and snack. The process is like a quilting bee in the kitchen! 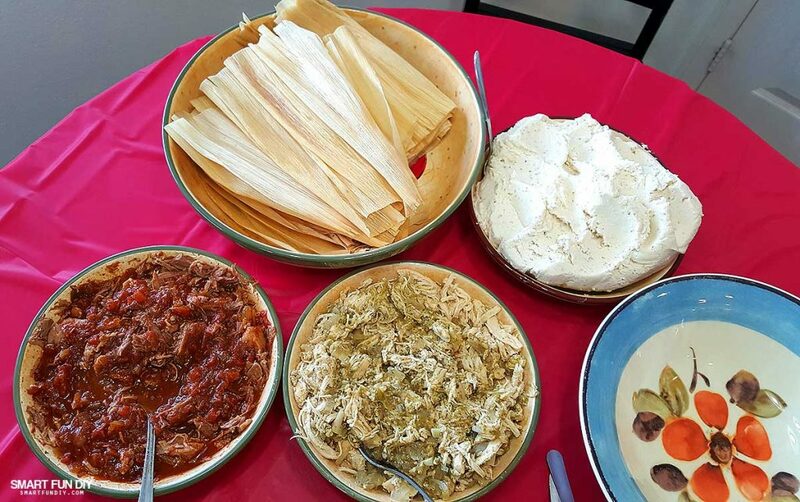 We set up a spread with all the supplies needed for making tamales – fresh prepared masa, pork and red chile, chicken and greem chile, spoons, soaked corn husks, and a large bowl to place the finished tamales in. Then everyone gathers around and makes tamales while talking and sharing. The prep for tamales starts usually the night before. First we soak the corn husks in water to soften them. You can find dry corn husks at the local grocery store. Be sure to wash them (sometimes they have bugs in them) and then soak them completely under water. We put ours in a large pot and then weigh them down with a plate to keep them under water. 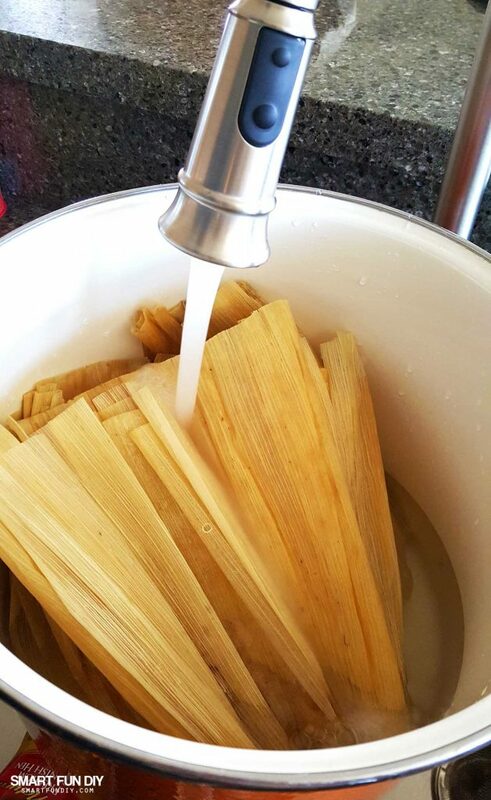 The water softens the corns husks so they can be bent to wrap the tamale. Soak until pliable, at least an hour. The tamales in both of these recipes get their incredible, authentic flavor from HERDEZ® sauces and traditional spices. 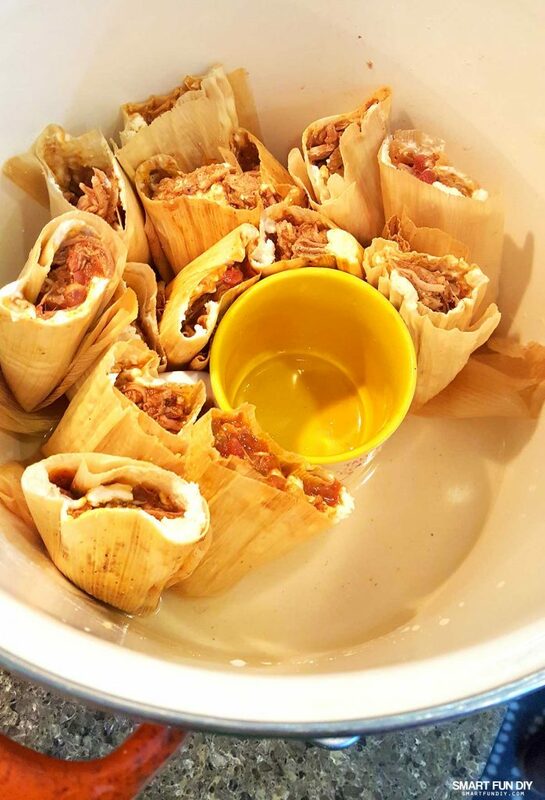 We prepare these tamales in the traditional way – we used the crock pot to make the meat! Okay, so that's NOT traditional but you can get the same flavors with a lot less hassle by using a plugin crock cooker rather than a pot on the stove to cook the meat. Luckily, Xaver won a second crock pot in an auction at work yesterday so we were able to cook the meat for both types of tamales at the same time. 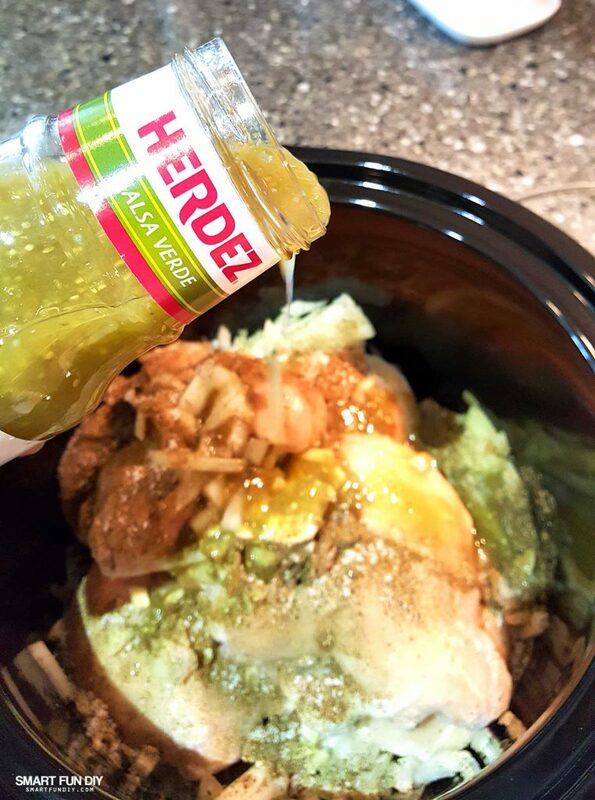 Our Chicken Tamales feature HERDEZ® Brand Salsa Verde, Mexico’s favorite and America’s No. 1 selling Salsa Verde. This salsa tastes great on its own, in guacamole, and in these tamales! You can start this recipe with frozen chicken breasts, like we did here. That makes it extra convenient to make! 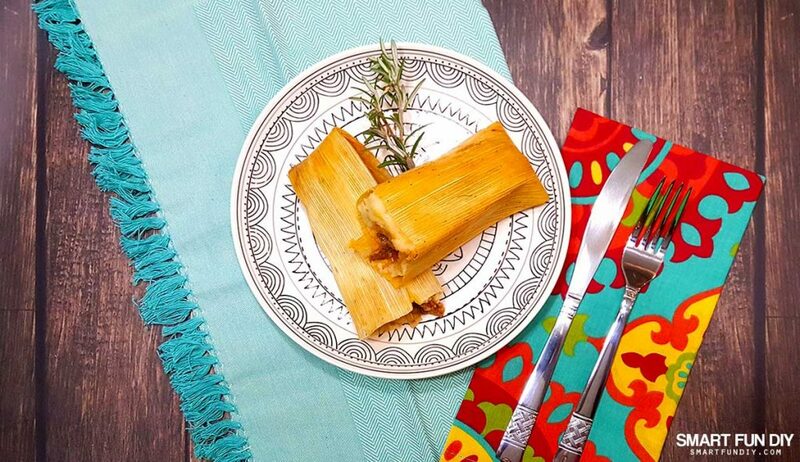 The Pork Tamales feature HERDEZ® Brand Salsa Casera (house salsa), which gives the pork a rich, full flavor. These are my favorite tamales! Check out the recipes below for the full directions on preparing the meat. 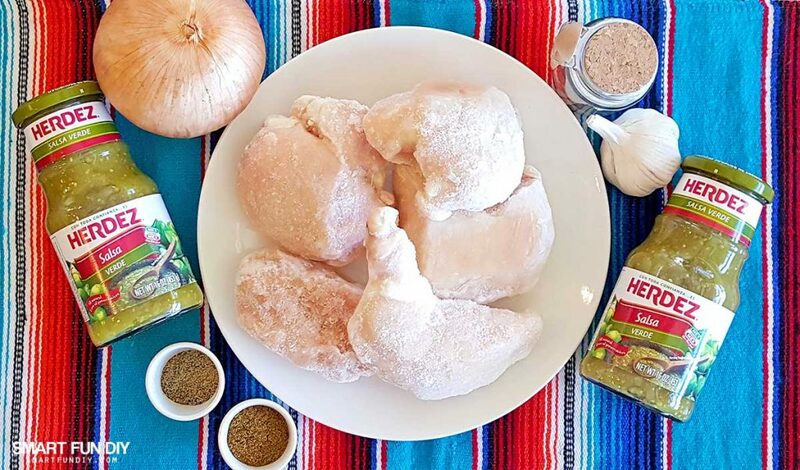 Here you can see how we literally just poured the HERDEZ® Brand Salsa Verde right on top of the chicken, along with spices, onions, and garlic, before cooking it in the crock pot. Serve both tamales with the same salsa spooned over top. My grandma likes to add a little shredded cheese too! 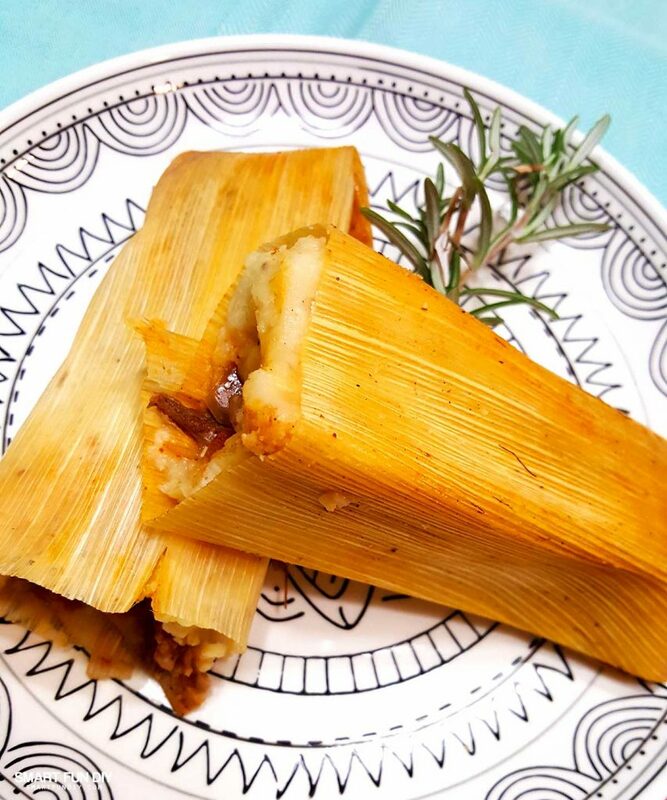 A delicious authentic chicken tamales recipe. These chicken tamales are so easy to make, you'll never buy tamales again! Prepare all ingredients, except for the corn husks and masa, in a 6 quart slow cooker. Cook the meat for 4 hours on HIGH until fork tender. Shred the meat with a fork. Soak the corn husks in warm water to soften. Flatten the corn husk against the palm of your hand. Using a spoon, spread an even layer of masa, about 1/2″ thick, over the corn husk, covering about a 3″ x 6″ area. Spoon the chicken filling into the center of the masa rectangle. Roll the sides of the corn husk around the meat filling. Fold up the tapered end of the corn husks. 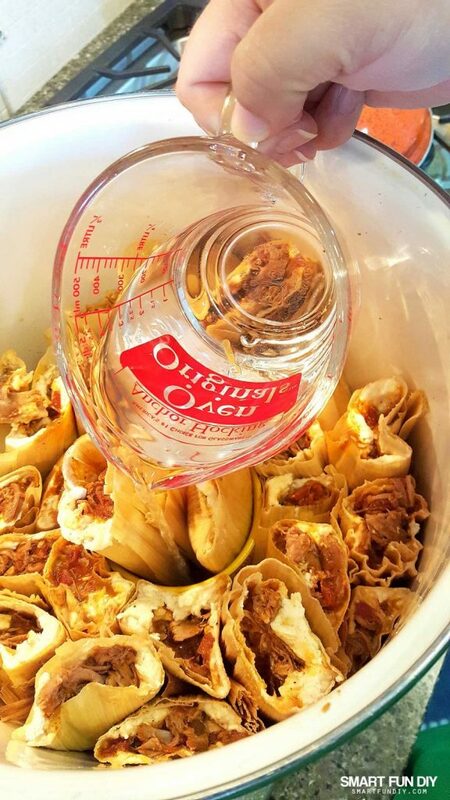 Place the tamales vertically into a stock pot with about 1/2″ of water in the bottom. Steam until the masa is semi-translucent on the edges. Once you've cooked the meat, it's time to assemble the tamales. After the tamales are made, they need to be steamed. The steam cooks the masa, which is essentially raw up until this point. It's important to steam the tamales, not boil them, and to make sure that you don't steam them too long or they will start to fall apart. You can get a tamale steamer but we just use a large pot. The tamale steamer has a basket that keeps the tamales vertical so that water does not seep inside the meat and masa. 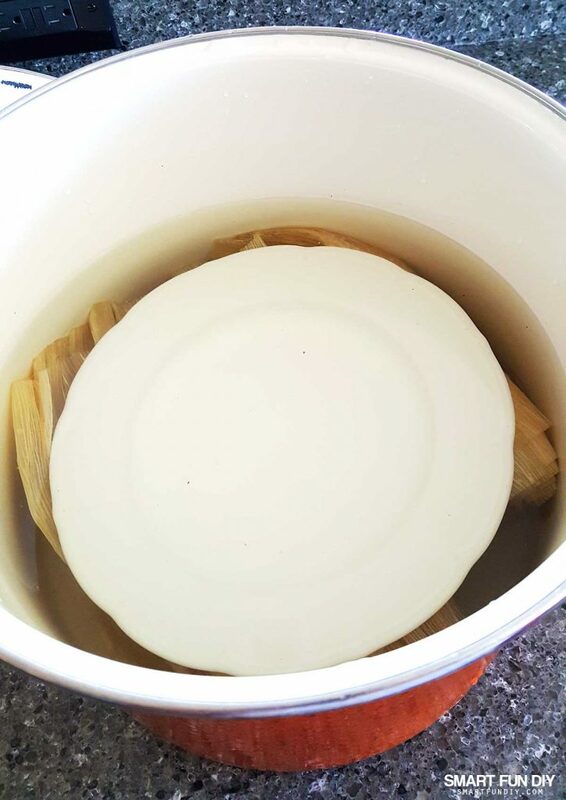 When using a pot, place a mug or bowl in the center of the pot to lean the tamales against so they will stay upright. You can even place a few tamales inside the mug or bowl to get even more in the pot. Fill the pot with abut 2″ of water and steam on medium or low for about 30 minutes. The masa will darken and become a bit translucent at the edges. This is how you'll know the tamales are done. Take one out of the pot and remove the corn husk to check that the tamale as cooked completely before removing the pot from the heat. 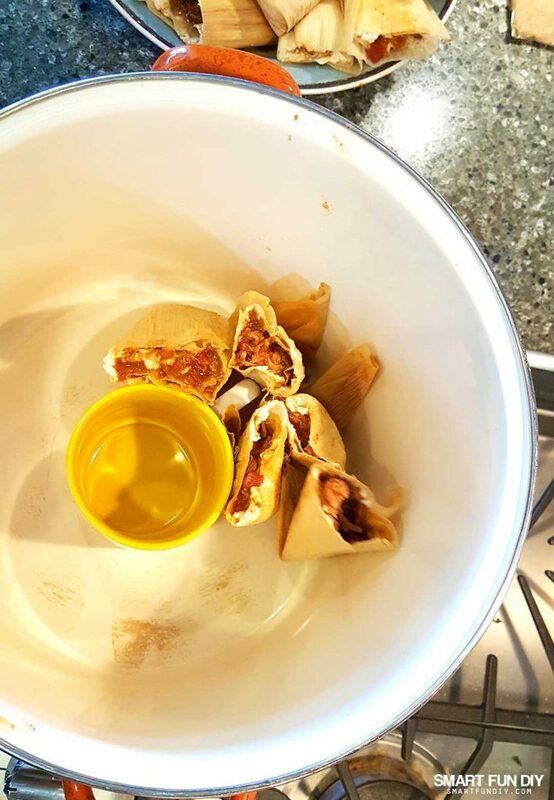 Once cooked, allow the tamales to cool to room temperature before placing in zip top bags and putting in the fridge. 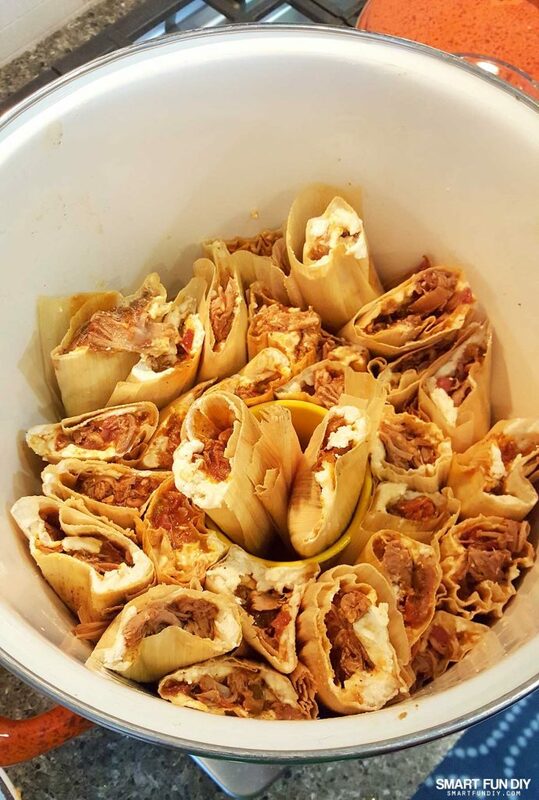 Our Las Posadas tradition starts with preparing the food, like these tamales. The second part of our Las Posadas tradition starts on the 16th and runs through Christmas. We set up a nativity scene and make sure the tree is all decked out. Then we visit with family and friends, going to each other's homes and sharing in great food, stories, and wishes about the new year. We talk about the story of Mary and Joseph and all the religious aspects of the holiday. As it gets closer to Christmas, we see more of the extended family; aunts, uncles, cousins, and more. It's not just family – we see friends too! 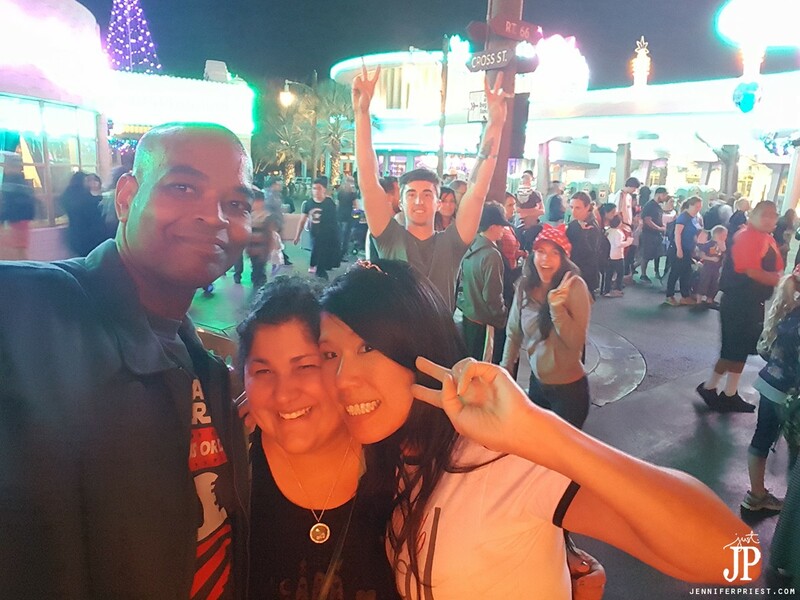 You better believe that even though we were at Disneyland, Elena asked me for tamales! LOL You don't have to celebrate Las Posadas at home only but honestly, the food is better when you cook it at home! Now that Las Posadas is here, how are you going to celebrate? Leave a comment and let me know. Not ready to make this recipe today? Pin it! Nothing says Christmas like tamales! It took a few years, but my sister and I finally perfected the process that we learned from my dad and my grandma. The family gets together, and it’s the entire experience that means the most. I have always made green tamales using Herdez. It’s bomb. I LOVE tamales but Jacob doesn’t and I always thought they were so hard to make. This made it look so easy I am going to try it for sure maybe next week so I can freeze them and have them anytime I want. Thanks for the amazing recipes! I’d love to know how they come out! I have a instant pot can this be achieved by using it? I love tamales.. never have I made any.but love them!!. I think you’d have to do some adjusting – I don’t have an Instant Pot but from what I read, you can probably do it! My friend just shared this on FB and I am sooo excited. I love tamales, can’t find any good ones locally, and thought they were too hard to make. I am looking forward to trying your recipe. Thank you so much for sharing. 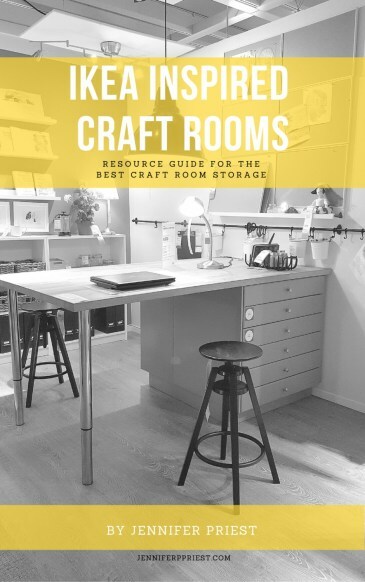 I want to try to make them. But was wondering Can you freeze them? Yeah, totally! Put them in a freezer bag once they are cool, get all the air out, and then put in the freezer. when i order tamales at the Mexican Restaurant, they always come with a red “gravy” or some kind of sauce on them. What is that? Chili? thanks for your easy to follow tutorial. I have my pork in the crockpot ready to try my first tamale attempt. Wish me luck!! Do you buy the chili sauce in a can or do I make it from scratch. Do u have a recipe? I’m having trouble keeping my hubby out of the pork. Your recipe is so delicious! LOL too funny! Okay you can use a can of chili beans if you like or chile rojo in a can. I’d add some extra spices and stuff to it. Or even the Herdez salsas or chiles I shared above – those would all work. How many dozen does the meat mixtures yield? It depends on how thick you make the tamales. Do I freeze the tamales before or after I steam them? It looks like you are NOT putting the red chili enchilada sauce in the crockpot while you are cooking the pork. 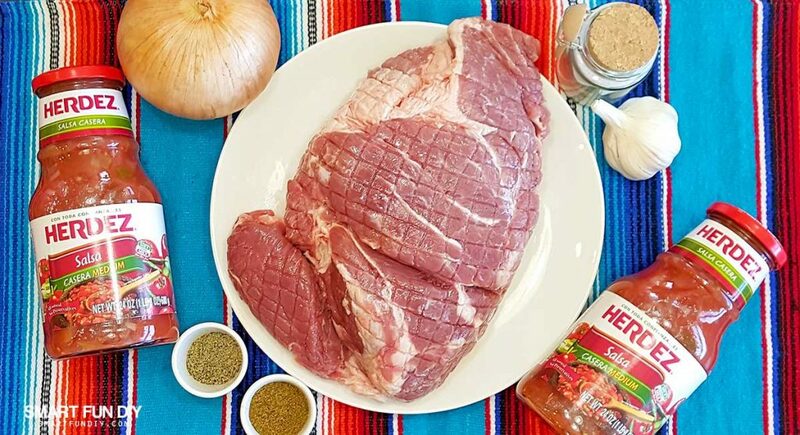 Are you adding the red chili enchilada sauce to the COOKED pork after it comes out of the crockpot but before you start to assemble your tamales to make sure they are super juicy? Wondering if water only goes in the cup in the steam pot like recipe shows or in the bottom of the whole pot? Please let me know as my daughter and I will be making this come December! Thanx for this recipe! You can put a little water in the bottom of the pot to prevent sticking but you don’t want much because it can make the tamales soggy. Let me know how they turn out! My mom and I plan on trying these out next week! It will be our first attempt ever at tamales ? About how many tamales do you get from each kind of meat? It depends on how thick you make the masa and how much meat you put in each tamale. Typically we get about 3 dozen tamales from one “batch”. So I’m cooking the chicken recipe. Do you shread it with the salsa liquid mix then assemble, or take chicken out and shread and assemble? Yum! I love Tamales! Your recipe looks great. I learned to make Tamales after we moved to New Mexico. Last year I bought a Masa Spreader and it was the best thing ever! Makes spreading all that masa so much faster. I’ve never tried the premade salsas for tamales. They look good, I’ll have to give them a try! Thanks for the recipe! Sorry but how do you make or where do you get masa. You can purchase the masa at regular grocery stores or a Mexican grocery if you have one nearby. My tamales are steaming as I write this! Doing a trial batch using masa preparada. Keeping my fingers crossed…this is a big adventure for a “gringa” LOL… Thanks for your recipe! Oh my gosh I can’t wait to hear how they turn out! !